Development of nuclear weapons began in early 1943, following years of scientific and engineering research. The Manhattan Project managers identified two methods of firing a nuclear weapon, and given the prospects for ending the war, America chose both. 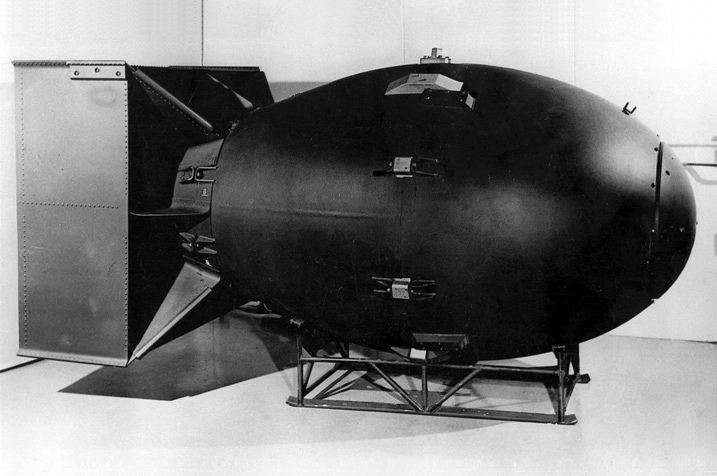 “Little Boy,” officially the Mark 1 bomb, was fueled by Uranium 235, employing the relatively simple “gun” assembly. The “firecracker” as Curt LeMay called it, was 10 feet long, 28 inches in diameter, weighing 9,700 pounds. Of those nearly five tons, only 140 pounds were U-235. Scientists were so confident that the bomb was not tested before deployment. When Enola Gay released the weapon on August 6, 1945, it was the debut without a rehearsal. After release from 31,000 feet, a barometric enabler activated four radar altimeters. When two of them agreed upon the desired altitude, they closed the firing mechanism, igniting six pounds of black powder. The hollow uranium “slug” was fired into the “target” cylinder, initiating critical mass. The bomb detonated at about 1,950 feet with an initial estimated yield of 13 kilotons, the equal of 13,000 tons of TNT. However, postwar analysis calculated the yield at 16 kilotons. Hiroshima was largely destroyed as the 12,000-degree fireball measured 1,200 feet across. Blast and fire left two-thirds of the buildings leveled or uninhabitable, and at least 40,000 people dead. After the success at Hiroshima, many American leaders expected Japan’s immediate capitulation. But others were more skeptical—or realistic. Major General Leslie Groves, overseeing the Manhattan Project, always thought that a second bomb would be needed to convince the Japanese of America’s capability and resolve. The Mark 3 weapon, called “Fat Man,” was a different creature, far more sophisticated. A plutonium sphere was set amid a surrounding girdle of high explosives. The sphere had to be exquisitely constructed to ensure uniform detonation by the 32 pair of detonators. When they exploded, the sphere was instantly compressed to critical mass. Fat Man’s trigger was so complex that it required proof before going to combat. The test was an unqualified success. At the “Trinity” site in New Mexico, the “gadget” prototype was detonated on July 16, 1945, producing about 20 kilotons of explosive energy. Fat Man was about 500 pounds heavier than Little Boy and, at 10 feet 8 inches long, a bit larger. It pulverized Nagasaki, where the yield was greater than Hiroshima—at least 21 kilotons, sometimes estimated as high as 23. The best example of the B-29 program’s importance to America’s war effort is its financial cost: $2.53 billion. By comparison, the enormous work and resources invested in Project Manhattan totaled about $1.88 billion.